Fancy Pans Café: London to Paris – ON A BIKE – IN FOUR DAYS! Why on earth would you? 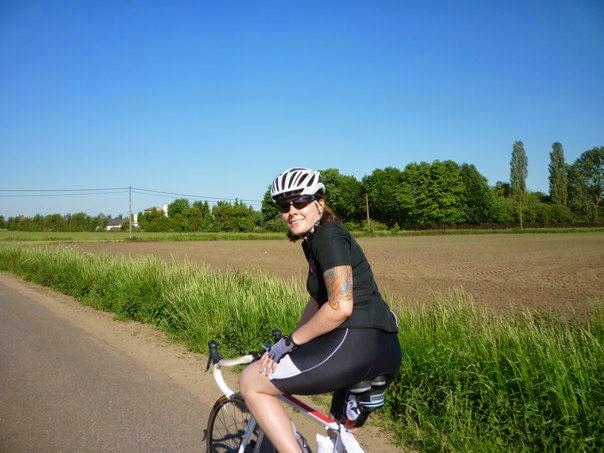 London to Paris – ON A BIKE – IN FOUR DAYS! Why on earth would you? This series will follow the journey of Jacqui Moore – super-fit cyclist on the journey of a lifetime. Friday, April 1st 2010 – April Fool’s Day. so why not fake snow? It was all going so well; Jacqui had been snowboarding for some time and was become quite adept in the skills of downhill slalom. Well, you can only go downhill, but I’m sure you can picture the scene: snowboarders descending the artificial snow, having a great time when suddenly it didn’t go all right for Jacqui. The board flipped and she flew, landing in a very inelegant manner. As she hit the ground there was a loud crack and it wasn’t the board. Jacqui had broken her leg in two places. She was taken to A&E and after waiting just SEVEN hours was plastered and sent home. She spent the next six weeks on crutches – I have never seen anyone climb stairs on crutches with such speed! After this painful experience and when the bones had knitted and Jacqui could walk without crutches she decided to put the (now mended) leg to good use. After looking into various ways she found that a London to Paris Charity Cycle Ride was organised for May 2011. That was it! Plenty of time to prepare and the leg, together with the other one, could raise money for charity. Jacqui chose The Terrence Higgins Trust as the Charity she would fund raise for through sponsorship by doing the cycle ride. Target - £1350 - Game on! We shall follow Jacqui from London to Paris, day by day, so watch this space and please enjoy the journey and experience with her.